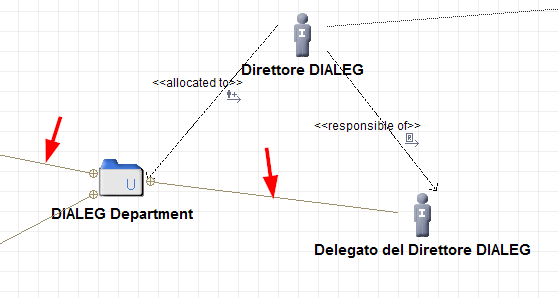 In a TOGAF "Organization Role Diagram", how can I hide the lines between the actors and the "organization unit" they belong to? This lines is auto-drawed when i adding actor and "organization unit". Thank you in advance, Vito. These can't be masked because they state that the Actor is actually in the Organization Unit. If you select the Organization Unit, then open the Symbol view (right of the diagram) and change the representation mode to 'Structured', you'll see that the Actor appears 'inside' the Organization Unit. You can move the Actor out, but then the model is different. osl, thnak's for you reply! I'll try to face my problem with yours suggests.